Handmade, handcrafted, one of a kind, shopping local, these are all words to describe what you will experience when attending a holiday market. I really enjoy attending several markets as we lead up to the holidays; you meet so many great artisans who spend their time creating these unique pieces of art, clothing, jewellery, aromatherapy items, food, the list goes on. Often I can cross so many people off of my shopping list and each person receives something that is often one of a kind. I’m able to share a story on why I selected that unique gift for them and a bit about who created it... plus, I usually end up buying myself some gifts too. There are so many holiday markets in Kelowna that it was hard to narrow it down to just 12. Bonus, by attending these you’ll get your shopping done nice and early so you can enjoy the holidays stress-free. Join for a magical Christmas market in the historical and quaint East Kelowna Hall. With over 45+ local amazing vendors, food, coffee, wine tastings, food trucks, live local musicians and so much more! Glass ornaments station for you to make as well! The 2nd annual Christmas Market! Santa and Mrs Claus will be back for professional photos from 11:00 am - 1:00 pm. While you shop for all your holiday gifts, you can also experience some magic and entertainment from magician Leif David, who will be at the event from 1:30 pm - 3:30 pm. Join the Landmark District and Craft Culture for the 2nd annual Winter Wonderland Christmas Market in celebration of the Tree of Hope Light-Up! Free Admission, Family friendly Craft Show! Under the Mistletoe will have over 35 craft vendors. A kids craft corner, kids face painting, and door prizes such as VIP wine tour tickets, dinner for two and much more! The winery bistro is open for organic delicious lunch! Plus, the wine shop is 10% off. This annual Sugar Plum Fair is on its way to Quails’ Gate again! Bring the whole family down for a festive afternoon including a winter market with local artisans and a 15% discount in the Wine Shop. In the spirit of the season, they will be accepting donations on behalf of the Central Okanagan Community Food Bank and Inn From the Cold - Kelowna, as well as toys for Kelowna Santas. Visit Lake Country’s Scenic Sip wine trail for a holiday tasting event. Enjoy a unique experience at each winery and in the spirit of giving, donations will be collected to benefit the Lake Country Food Bank. *Donations may be cash or non-perishable food items. The 10th Annual Touch of Christmas Crafter and Vendors Fair! Your unique one-stop Christmas experience; featuring 80 plus crafters & vendors, 50/50 draw, door prizes, online and onsite silent auction, musicians and performers. Our Touch of Christmas Cookie Bar will be serving mouth watering Christmas cookies and delicious beverages. The Downtown Kelowna Winter Street Market returns on December 1, 2018. Come on down to Stuart Park & Water St. and explore the festive market, skate on the Stuart Park ice rink, listen to the live music or even meet the big man in red himself. At the market, you can indulge in some festive sweets and treats, munch on some delicious street food, or sip your hot chocolate by a cozy fire. Once you’ve taken all that excitement in, finish the evening off with the 30th annual tree lighting celebration. At this Fab Five event, you’ll enjoy light treats paired with our wines & ciders as well as live music. We will have deals and discounts on for your holiday shopping. Get the perfect gift from our fun & cheeky wine shop. Please bring a can or package of food for the food bank. Sip some wine. See some crafts. Cross some holiday shopping off your list while enjoying an easy afternoon touring the wineries of the Westside Wine Trail. During our Sip into the Season event, which takes place the first Sunday in December, visitors travel from winery to winery as they enjoy the works of the artisans and crafters at each location as well as tasty bites and sips. This is the largest genuine craft fair in the Okanagan – with over 175 talented crafters & artisans selling handmade/designed wares. This is the perfect place to buy unique items for even the toughest person on your shopping list! Looking for a place to warm up, check out local art, and enjoy some local treats? Stop by the Winter Warm-up and Market at the Kelowna Visitor Centre. There will be games for the kids, a silent auction, prizes, and more. 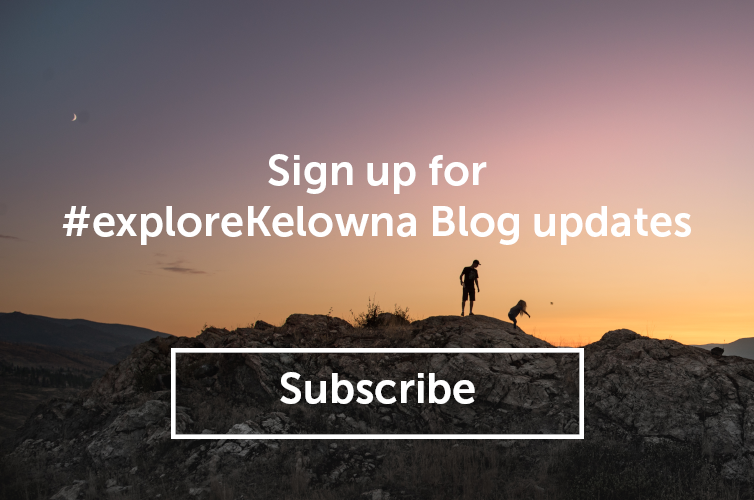 Come together with your community and enjoy everything Kelowna has to offer.